There are several subtle things about Mark’s portrayal of this man’s encounter with Jesus that make it my favorite. Each of the three synoptic gospels offers the same story but include slightly different details. (Matthew, Mark, and Luke are called the synoptic gospels, which means they were “seen with the same eyes”). Scholars agree that they used common source material, or were perhaps aware of whichever gospel was written first (most think it was probably Mark) and borrowed from it to reach their own intended audience. 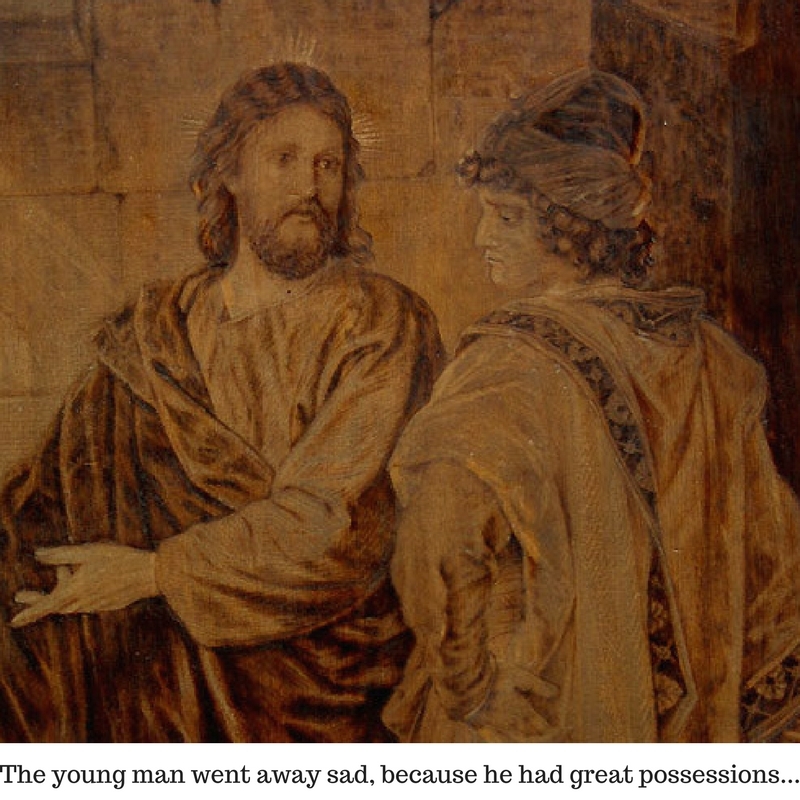 In this story, all agree that the man had great wealth, that he approached Jesus sincerely asking about what he needed to inherit eternal life, and that he went away disappointed. Matthew 19:20 notes that the man was young; Luke 18:18 identifies him as a ruler. Only by combining these details are we informed that this is the story of “the rich young ruler,” perhaps one of the best known stories about Jesus during his ministry. A few observations taken from Mark’s account: 1) The man ran up to Jesus and fell on his knees. There was a sense of urgency about his quest, and he exhibited humility in front of Jesus. Is there anything in your life that should prompt the same type of approach? Should you have a sense of urgency about taking a question to the Master, or hearing his response? Should you humble yourself before him? 2) He called Jesus good, and Jesus challenged him to evaluate where goodness came from, reminding him that God alone is good and that accepting his compliment was tantamount to accepting equal status with the Almighty. All goodness springs from the character of God, and while Jesus did not deny the truth of the man’s declaration, he did point out exactly WHY he could be considered good. 3) Jesus lists the “horizontal” commandments—the ones dealing with other men—and omits ONE. It’s interesting, because the one he omits is “Thou shalt not covet”, which happens to be precisely where this man’s heart issue lies. When the man answers, he is portrayed as honest and sincere, but perhaps he noticed what Christ omitted and could see what was coming next… Before you feel too smug about this ruler’s weakness, what commandment do you think Jesus might have omitted if he was talking to YOU? Would it have been coveting, or murder, or adultery, or lying, or committing fraud, or disrespecting your parents? No matter how moral we act, and no matter how good we have been, there is always a place or two where we are vulnerable, or that we put ahead of God on our priority list. What is your weakness? What do you love more than God? 4) “Jesus looked at him and loved him.” Jesus didn’t look at him judgmentally, and he didn’t look down his nose at him in self-righteous condemnation, but he offered him a heartfelt invitation in sincere love. That’s a telling part of the story because it applied to Jesus then, and it applies to him today. In the midst of our sin, Jesus looks at us exactly the same way. 5) When Jesus invited the man to follow him, Mark says, “At this the man’s face fell. He went away sad, because he had great wealth.” If you are an American Christian, you are at least somewhat in the same position. Compared to the rest of the world, you have great wealth. According to the New York Times, “the typical person in the bottom 5 percent of the American income distribution is still richer than 68 percent of the world’s inhabitants.” Each of us who is fortunate enough to have the kind of stuff we take for granted in this country should ask ourselves, truly, do I love God more than I love my stuff? In the rich young ruler’s case, “he went away sad because he had great wealth.” Don’t be that guy. Think carefully about what you have and what you COULD have; and go away happy instead of sad. You hear the love in Jesus’ voice. On earth, or in eternity. How will you feel when you walk away? It’s time to speak. What will you say?